Here in Australia, we are lucky enough to have plenty of sunshine for much of the year. While in some instances it is nice to bask in the sun’s rays, sometimes the heat and glare simply becomes too much. Modern Australian homes often make use of a number of glass features, from large windows and skylights, through to glass roofs. They also tend to include outdoor entertaining areas, in order to make the most of our amicable climate. However, when sunlight becomes too intense, it can restrict the usage of these types of areas. Here at Sunteca, we have the perfect sun control solution: the Varioscreen retractable sunroof. 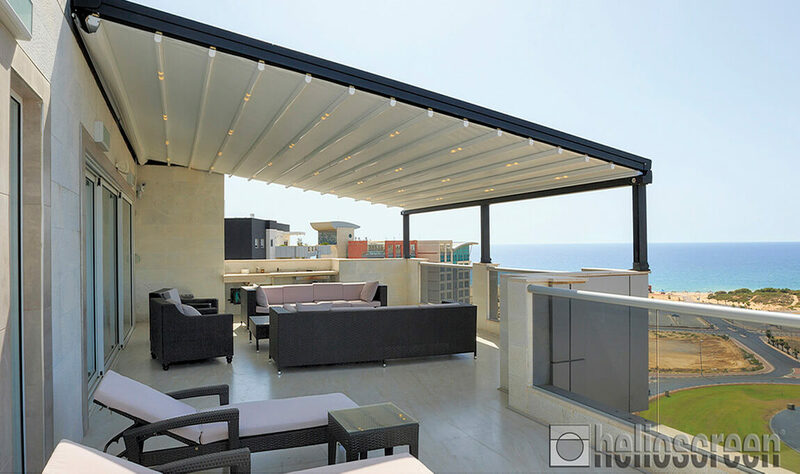 One of Helioscreen’s most popular retractable roof systems, this dynamic product allows natural light to pass through – whilst keeping out unwanted heat and glare. Fully retractable, you can fold it away in winter, or on overcast days. Varioscreen is now available in models to suit flat glass roofs and sloping glass areas, and these screens do not compromise the aesthetic appeal of the building – nor the view from within. This product also comes in a non-transparent fabric for those looking for a greater level of protection. Sunteca also offer a full range of motorised awnings. We will provide and install your preferred pick of motorised retractable awnings on your premise, whether this be your business or your residence. If you are looking for an effective sun protection solution, look no further than Helioscreen’s retractable roof systems. With a wide range of sizes and fabric types available, there is sure to be a product to suit your specific requirements. For more information, call Sunteca today on 1300 853 518. Collect PDF Brochure for click.